On Thursday, December 8, the world lost a man who will go down in history as the first American to successfully orbit the Earth, circling three times. 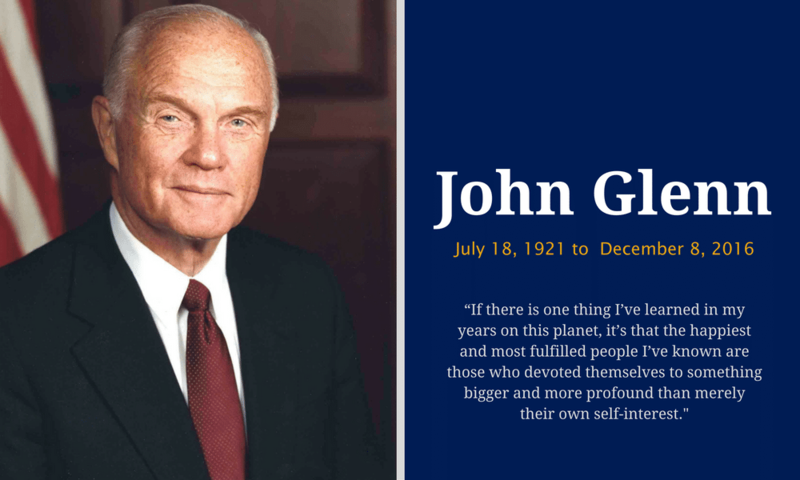 John Herschel Glenn Jr. passed away at the young age of 95. “Mr. Glenn had recently been hospitalized at the university at the James Cancer Center, though Ohio State officials said at the time that admission there did not necessarily mean he had cancer. He had heart-valve replacement surgery in 2014 and a stroke around that time,” reports the New York Times. Mr. Glenn was an American aviator, engineer, astronaut and United States Senator from Ohio. He leaves behind his wife Annie (96), who he married in 1943, his two children, Carolyn (69) and John (70) and two grandchildren. Mr. Glenn will be deeply missed and most certainly never forgotten.